Al Thomas Jr. (left) and Ron Lantz speaking at the Senior Center in Charlottesville. Albemarle County Chief of Police Ron Lantz and Charlottesville Chief of Police Al Thomas Jr. will address current policing issues including traffic concerns, staffing levels/shortages and gangs. Albemarle County named Ron Lantz as chief of police effective June 1, 2016. Chief Lantz served as Albemarle’s deputy chief of police where, since 2012, he assisted the chief of police in planning and directing the many activities of the Albemarle County Police Department including providing supervision for 115 of the 129 sworn officers in the functional areas of patrol, traffic, school resource, crime prevention, and animal control. In addition, Chief Lantz was responsible for leading the implementation of the County’s Geographic Based Policing initiative which was launched in 2012. Prior to joining the Albemarle County force, Lantz completed his career with the Fairfax County Police Department by serving as a district station commander where he was responsible for 155 officers providing police service to 125,000 residents. While with Fairfax County, Lantz received the Departmental Meritorious Commendation, the Departmental Meritorious Action Award, and the Departmental Meritorious Service Award. Lantz received his Bachelors of Science from the University of Charleston with a major in Organizational Leadership. He successfully completed the Key Executive Leadership Certificate Program from American University and is currently enrolled in courses geared towards a Master of Science with a focus on Criminal Justice and Public Administration from Liberty University. Lantz is also a graduate of the DEA Drug Commander Academy, the FBI National Academy, and the Virginia Association of Police New Chief / Deputy Chief School. Alfred S. Thomas Jr. was appointed Charlottesville chief of police effective May 23, 2016. Chief Thomas served as chief of police for the City of Lexington, Virginia, since 2010. During his time in Lexington, he has directed a number of major initiatives, including operational reorganizations, upgrades to emergency communications infrastructure, implementation of mobile data terminals and digital in-car camera systems, and expanded outreach to city youth with the implementation of multiple programs including a junior police academy, police summer camp, and a regional high school internship program. Upon his appointment to chief of the Charlottesville Police, he was cited for his experience, interpersonal skills and leadership abilities. Prior to his time in Lexington, Chief Thomas spent 20 years with the Lynchburg Police Department working in varied roles with increasing command responsibility. From 1985 until 1990, he proudly served in the United States Air Force, attaining the rank of staff sergeant. 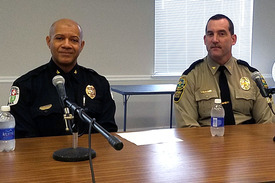 Chief Thomas was chair of the Rockbridge Regional Law Enforcement Command Board, vice-president of the Rockbridge Area Housing Corporation Board of Directors, is a member of the National Organization of Black Law Enforcement Officials and the Virginia Association of Chiefs of Police, and serves on the Board of Directors for the Rockbridge Area YMCA. Thomas and Lantz spoke at the Wednesday November 8, 2016 meeting of the Senior Statesmen of Virginia. The meeting was held at the Senior Center in Charlottesville. Following the presentation, questions were taken from the audience. The program was moderated by SSV Vice President Rich DeMong.